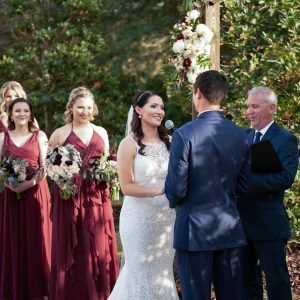 Laura and Joe chose the beautiful Palmetto Club at Fishhawk Ranch as the Venue for their wedding ceremony and reception in late December. Laura looked amazing as she made her way down the aisle escorted by her father to join Joe in front of their wedding arch. There, in front of their family and friends, the couple shared their vows, exchanged rings, and were pronounced husband and wife by Rev. Rick Lackore of Sensational Ceremonies. Florals and Décor provided by FH Weddings and Events and Ceremony Music and Sound provided by DJ by CJ. Congratulations to the new Mr. and Mrs. Joe Benton!